Built upon a level 50’ x 150’ city lot and hemmed in tightly by its neighbors, this small house of 1,650 sqft. conveys spaciousness due to its angular layout, extensive use of glass, and garden landscaping. The entry is sheltered within a deep recess centered between two wings of the residence that project towards the street. Upon entering, one is presented with a naturally lit interior enclosed garden, open to the outdoors from above, that serves as a focal point from within the house. Rooms wrap around this gardern and all look into except for one. Once inside, there is not a sense of being closed in or of light being shut out. There is a gentle angularity to the walls, ceiling open in-plane with the roof, and maximum introduction of natural daylighting that together convey a flowing continuity of spaciousness that reaches through the house. The house is limited in width by six feet side yard setback, which are turned into outdoor patios and service yards, allowed to the property line. Six foot high wood fences maintain privacy. The living room is actually at the back of the residence, and by virtue of floor to ceiling glazing, the entire rear yard becomes its extension. To the left of the front door, one turns past the interior garden into a wing containing a master bedroom and bath, as well as a large room for the client’s two daughters, which could be subdivided for privacy. To the right of the front door is a smaller wing containing the kitchen and dining area. This roof of this wing is extended towards the street and serves as a carport. 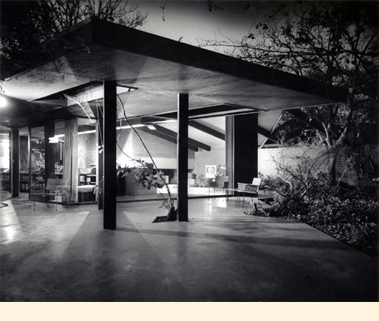 Rudolph Schindler residence. Tragically, the Reif residence was destroyed by fire.